On Saturday, Will came tearing into the house and I was afraid some catastrophe had happened. But when he told me “The wild turkey is back!” I about jumped up and down in excitement. And, he said, she’s not alone! She brought her daughter. The daughter is not this spring’s batch, but the spring before as she is a full grown adult. You can see the wild turkey coloring but she is also slate gray mixed and we have a slate gray tom. Hmmm, we know who Daddy is. Now they fly in and out of the chicken yard and have tamed down so I can go out and toss them some grain without causing any disruption. We’re so glad. Our wild turkey hen is back — with her daughter! Since we’re really sucking it up to save money to pay much more on the principal of our land payment for the new forty acres where David’s cabin is being built, I’ve totally quit buying snack type desserts from Walmart’s day-old shelves. Yep, I got lazy as we were so hugely busy. So yesterday I made a great big apple pie that was really good. (If you’d like some tips and a recipe, check out my article “Can she bake an apple pie, Billy Boy?” in Issue #77 of Backwoods Home Magazine or the Thirteenth Year Anthology. It’s also in my book, Jackie Clay’s Pantry Cookbook.) We even had a piece of the pie for breakfast. I also whipped up a batch of chocolate chip cookies as it was cold outside and I was in a baking mood. Yesterday I cut one of our last Iran pumpkins open to seed it out. Such a gorgeous pumpkin, both inside and out! The meat is three inches or more thick and bakes up very nicely. We just loved this gorgeous, productive new pumpkin. 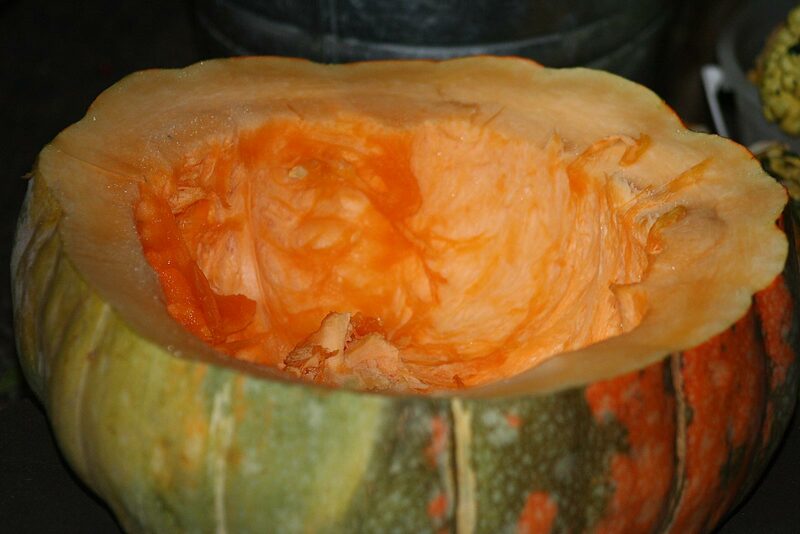 The Iran pumpkin has luscious, thick meat as well as a gorgeous sea-foam green and orange striped colorful skin. I’d like to take this opportunity to thank and honor all of our American Veterans, both living and dead. Without them, our country would not survive and those in other countries would also suffer tremendously. Our weather remains very cold and snowy. We were so lucky to have gotten the footing piers for our new solar array poured before it got so cold. They are all set up nicely and Will is busy working out the measurements and details for the rack which will hold them. I can’t wait to see them up! It will cut our gas bill (for the generator) down to hardly anything at all. We are working on ways to even further reduce that so we can run the house with Mother Nature. Yea! 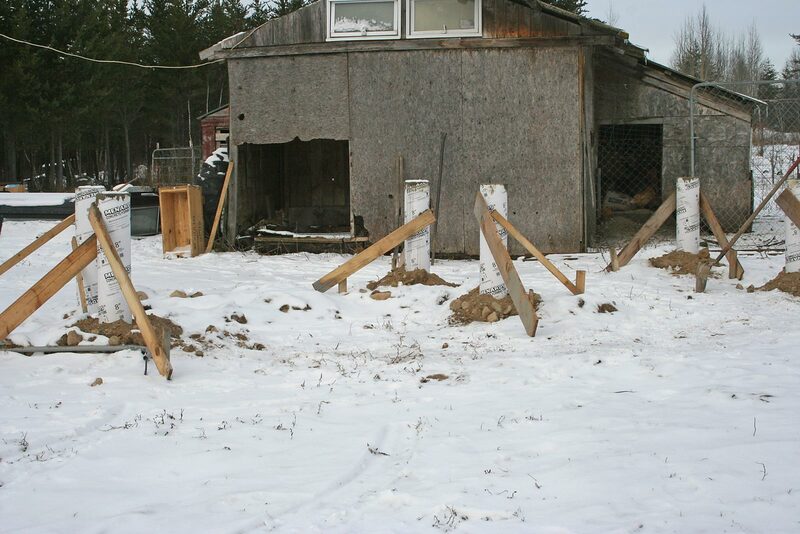 We were so lucky we got our cement footing piers poured for our new solar array before such cold weather struck. I was wondering. Where do you get your solar panels? Are they 100 or 200 watt? I’d like to know more about it. Where do you get the batteries? Do you have separate plug-ins in the house for each array or what? I m so happy that you’re getting your solar set up. We lived off grid for 13 years and it was so nice to not have an electric bill. We rarely used the generator,just in the winter when it would snow all day. I liked knowing our power came from the sun.we currently can be on or off the grid. So since we are used to limiting our power usage we use the regular power in the winter months. Yes, when you live off grid, you quickly learn what saving power means! Miss Jackie I am nearly as happy about Mama Wild T,and her adult daughter, as I would be if she were at my place. Have been having wild turkeys visit my orchard. I believe some of them are also mixed due to very light coloring on a couple of them, and several being unusually large. We have a farm neighbor who keeps a mixed flock of turkeys and a lot of pea fowl. They all run nearly wild in the mountain behind us. I was tempted to bag a very large turkey, but decided that watching them come in to scratch about is more gratifying; we see from 9 to nearly 20. More than half appear to be wild. Good news our local grocery stores are selling frozen turkeys for exceptionally low prices from now until Thanksgiving Day. I purchased one for our holiday but I think I’ll “bag” a few more at these prices for the freezer and can them before the Christmas holiday for the pantry as they keep so well and make a very nice quick meal for company. Yep, it’s always a great time to pick up those sale turkeys. I love having lots of canned turkey and turkey broth in the pantry! So easy, quick to fix and tasty too. 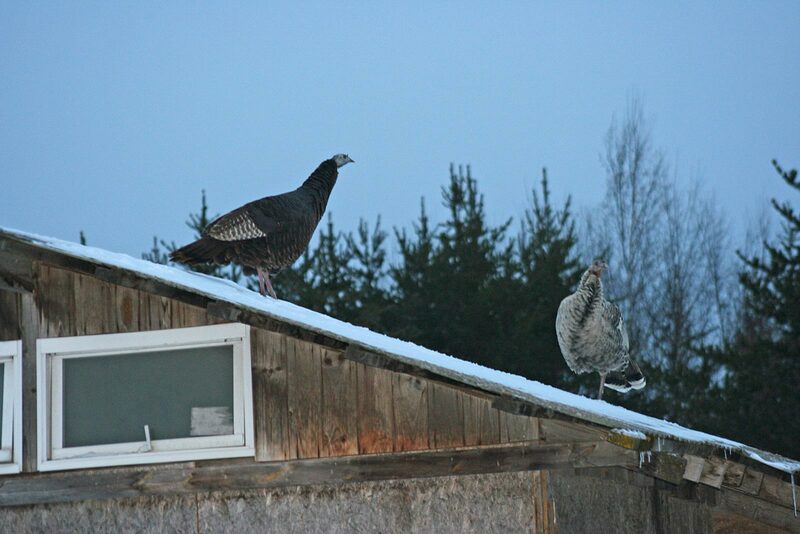 We plan on raising some wild turkeys this spring to release on our homestead. As we are so far back from the road and have plenty of State and Forest Service land around us, we hope they do well. We do plan on feeding them in the woods during the winter to help them survive. Glad to hear mama came back and brought her daughter. So happy the footings are poured and ready for the framing to support the solar panels. The pumpkin looks good and I was wondering how long the vines were on it? I have raised beds and was just wondering. The vines are pretty long; about 20′. So I don’t think they’d be good for a raised bed; maybe a designated spot in a corner of the yard?